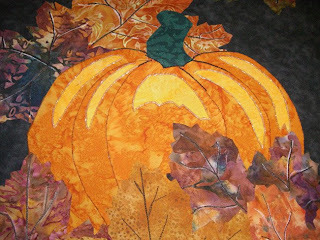 I finally finished removing all of the threads from the front of the fall wall quilt. It's so hard to pull brown threads through on dark fabric, they tend to disappear. Once I finally pulled all the thread through, I looked at all that I needed to finish on the applique'. Then, I had a flashback to the 80's when we used to make sweatshirts with fabric applique on them and we would always seal the applique edges down with the fabric paint. I must have had a whole wardrobe of finished sweatshirts with fabric painted designs on them. I then remembered that I recently purchased a bottle of the fabric paint in one of my craft magazine. Now, where could it be. Let me tell you, I found it in my 3 drawer I searched so I was very happy. I examined the color and it was called Diamond, it was sparkly. Yeah, I found my bling bling for this quilt. I tested it out and to me it had coppery flecks in the clear glue... I was sold. For now, the only place I added it was on the highlights from the pumpkin. I've set it aside to dry for the day and will take another photo and look later. But from the early results, I just may adhere the leaves this way. Let me know what you think.... Improvement or Detraction? You'll need to click on the photos to see the better details.